Taking the passions of helping the earth and always making it a part of the journey for this candle company. Full Circle Candles is proud of a small recycling program that started two years ago. People bring back their empty jars/lids and get a new candle for a discounted price. I didn’t know such a small gesture would grow into recycling over 400 jars in the last 2 years. We will continue this effort and also will be implementing some free gift candles for our dedicated recyclers. Look for this soon!!! Full Circle Candles is also excited to be attending the Earth Day Festival in Centennial Park, Nashville on Saturday April 22nd from 11-6. Climate Change is on top of our list of concerns so we will be donating 10% of profits to the Alliance for Climate Education on that day and for rest of the month of April. This applies for online and local orders as well! Earth Day is April 22nd and lots of events are going on around our country. Hope you get to participate in some outings that day enjoying this planet and learning how to take care of it better. Every little bit helps. It starts with you. I miss this. Sitting in a coffeehouse, writing to all of you in the early quiet mornings. We all know that ruts can take over our lives a bit, but it is sure good when we wake up for a moment, taking a small step. My rut lately in business has been stagnation and which road to move forward on. Slowly, as ideas present themselves, steps to move forward begin with a great sigh of relief. I am glad to be a big fan of Shark Tank, but I always wonder after they get the deal well, what happens? The after shows helped to open my eyes. No one is alone in the pool of the the entrepreneaurial lifestyle. There are great joys with running a buisiness, but also great challenges. As the small business grows, the demand becomes bigger then the fulfillment. Glitches and stressful decisions increase. The learning curves feel more winding. It moves you to face the challenges and find creative ways to swim through it all. Best advice I ever received when facing a brick wall is tomorrow is always a new day. Everyday is a chance to put something in place, to make a call, to write someone, to refresh, to make a decision that helps you and your company. Accomplish a small daily task to create that newness. My goals today are to fill up my calendar with craft fairs for my candle business and write another store about carrying my line of candles. I sit here drinking my coffee, listening to the community around me talking, living, and laughing. I am aware my office can be a coffeehouse if I choose, with inspirational events all around me and well, I wouldn’t trade this for anything, challenges and all. A few days ago I wrote about Full Circle’s flourishing recycle program. It started small and grew and grew. Little did I know that this would lead to more ideas on giving back to causes I care deeply about. It has been a strong part of what I wanted for this special candle company. It is called Full Circle for many reasons, one simply being, to pay it forward. From this inspiration of helping the earth it now moves into fundraising and the give back candle is born and the cause is Standing Rock. In my own life, the Native American culture is extremely close to my heart. I have been watching the movement at Standing Rock for months. If I was not a mother with a business I probably would be there too. I recently found out that there is a great need for supplies and such to keep the camp flourishing, especially as winter approaches. Some wonderful folks in my area have decided to hold a fundraiser at a local Episcopal Church for this cause next Saturday, November 26th, and with their great support, I created a candle to be available at the event. I am so honored to be a part of any little bit of this, even if small (like that recycle program). If this wonderful, sacred candle helps the people at Standing Rock, even one get some supplies, it is a success. So here it is and will be available on the website (in any scent you wish) and also it will be carried at my craft table for the whole holiday season!! It will be sold for as long as the people Stand Strong (Nah’zhee Soo-tah) to protect their land. Hence the Mighty Buffalo Energy. Every little steps helps. Live in the circle. One of my candle customers has become a dear friend and she has written a wonderful review for Full Circle Candles. Thank You Liz for your kinds words. Candles bringing people together. Enjoy reading my first guest blog candle review!! Scientific research has shown the strongest sense to trigger memories is scent, and French writer Marcel Proust has written about “odor-evoked autobiographical memory.” Maybe this is why I’ve always loved candles so much – the right one can take me back to happy moments in my life. One candle I got as a child called “Oceans” produced by Pier One reminded me of vacations at the beach. Anything cucumber melon-related takes me back to my high school days when that was the “premiere” new scent at Bath and Body Works (and has recently been brought back this month as a featured “throwback”). I also am a big advocate of shopping local. I love Farmer’s Markets and supporting personal entrepreneurships. When I moved to the small town of Monteagle, TN from New Haven, CT in the summer of 2014, I was delighted to find the existence of the large Chattanooga Market about 40 minutes away that specialized in all manner of goodies from local veggies and cheeses to, well – candles! Let it be known I am a bit of a hippie. I love nature. LOOOOVE nature. And eco-friendly products are a huge draw for me. 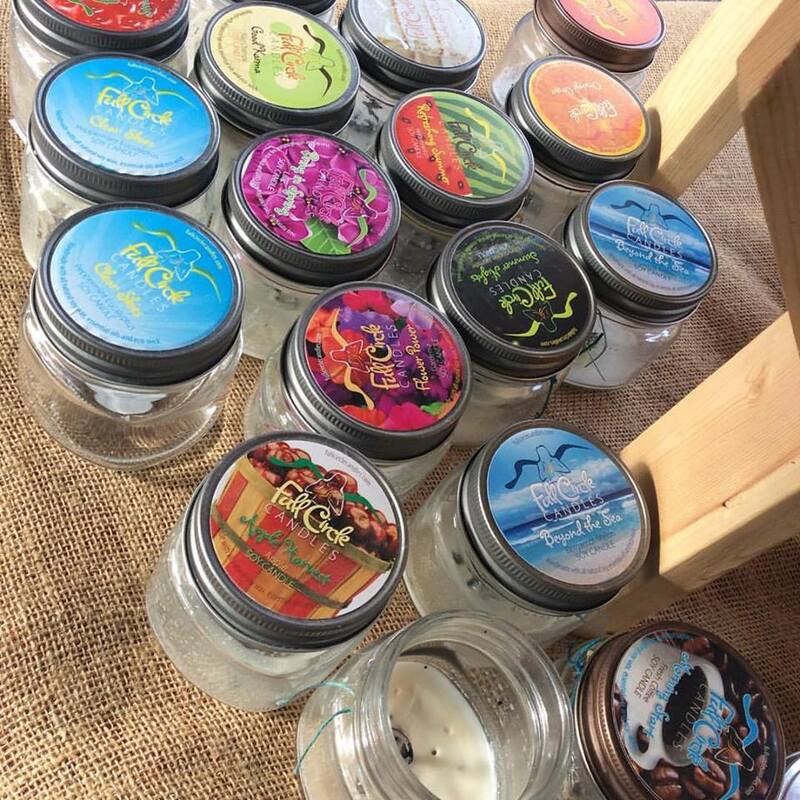 So “naturally” I was drawn to Full Circle Candles table at the market. Debbie greeted me with a smile that was genuine and spoke without a trace of a southern accent – something that made me wonder if she was a transplant like me. One of the first candles I picked up was “Summer Nights” – Honeysuckle Jasmine-scented – and BOOM, there I was back in my grandma’s backyard, enjoying the fireflies on a warm July night in Virginia. She had a huge honeysuckle bush that I used to “sip” on as a kid. Of course, I had to have it. When I took it home, I was impressed not only at how long the candle lasted and how clean the soy-based wax burned, but how glorious it smelled – all the way down to the last quarter-inch. When I discovered she also had the burner tarts, I had to go back for more. The tiny charms tied around the candles, butterflies or hopeful messages like “love,” “grace,” and “friendship” reflected the care she obviously takes in developing her product. It was so impressive, and I soon found myself seeking her out and spending longer and longer at her booth at the market and at other festivals in the area, sharing my stories about what her scents reminded me of, narrowing down my ever-changing list of favs (currently Summer Nights, Soul Friends, and Rising Buddha), and finding common threads like our love of the great outdoors and animals. My intuition about her accent was right – she is originally from the Northeast, and growing up in the tri-state area we commiserated on the challenges and perks of moving to a new place. In April 2015, hanging out at her booth at The Trails and Trilliums Festival held annually in the spring in Monteagle where we both live, I realized to my surprise that we had officially become friends. Debbie inspires me in so many ways, not only with her spirit of professionalism in her work and her product while balancing family and personal obligations, but with her supportiveness and genuine kindness towards others. She followed her dream of creating this company despite setbacks and naysayers and she’s made it a thriving reality because everything she does is done with passion, and that comes through in her product – every candle is handmade and unique in its own right, right down to the customized charm. I will be forever grateful her product brought us “full circle” together as dear friends. Full Circle Candles Joined Whole Foods! Over a year ago I was shopping in Whole Foods Chattanooga. My daughter and I stopped in the candle section to smell candles. She looked at me and said “Mom, why don’t you see if they will take your candles here.” I shook my head with a no, shrugged my shoulders and expressed my nervousness to do that. Then she said “The worst they can say is no.” I pondered more as we walked around shopping and then I stopped, looked at her and said “You know, you are right.” I got up my nerve, asked for a manager and the answer I got that day was “bring in some samples.” The rest is history. There was much paperwork, learning curves, but all worth the wait. The support from my local liason was incredible and we just kept going forward till those special candles hit the shelf. It is one store, a beginning and I will be applying to more. I have learned that the worst anyone can say is “No.” Good lessons to learn. Overcoming fears and believing in oneself. I love all the support and good things people have to say about the candles. A following is occuring and it is pretty amazing. I hear how authentic and special they are to so many people. It is more then the soy candle. It is a story of never giving up. It is a movement with meaning. Full Circle has made it into Whole Foods! We are celebrating still. And So It Is!